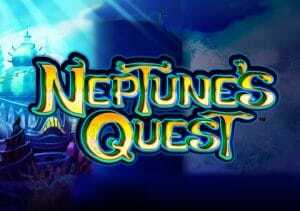 Go hunting for lost underwater treasure in Neptune’s Quest, a myth and legend-themed video slot from WMS. Based on the Roman god of the ocean, it’s played using an unusual 11 reel, 100 payline game engine. The only extra is a free spins round that can be triggered in 2 different ways. Look out here for an expanded wild and locked symbols. Play on all devices from between 50p and £250 per spin. The configuration of the reels is rather unorthodox. There are a pair of 2×2 boxes to the left of the screen, each of which offers 4 individual reels. They’re joined by a more standard 3 reel, 6 row set to the right. Together they offer a combined 100 paylines. Like most WMS games, the design here has the look of a live casino slot. Joining the lower value A to J symbols are an assortment of starfish, shells, fish and tridents. More rewarding are the water bull, mermaid and Neptune symbols. The latter is the most lucrative symbol. A 5 in a row combination featuring Neptune awards a payout of 5 times your total bet. Helping to create those winning combinations is the octopus which is the wild. This substitutes for everything bar the scatter (the underwater city symbol) and pays up to 5 times your bet per payline. The highlight of Neptune’s Quest is the Free Spin Bonus feature. Unusually, you can trigger it in 2 different ways. Landing 3 scatters on the big reel set is one way of doing so. Landing 4 matching symbols in 1 or both of the smaller reels columns on the left is the other. Either way, your reward is 5 free spins. If you triggered the round by matching symbols, then they are held for the duration of the free spins. You can also expect to see an expanded wild spin around the big reels set during those free spins. If you’re lucky enough to land the scatters and the matching symbols together your reward will be 20 free spins rather than the standard 5. The sticky symbols and expanded wild are in play here too. You can also retrigger more free spins. The unusual set up makes Neptune’s Quest look more complicated than it really is. The key is unlocking the Free Spin Bonus feature. Get a high value symbol to lock and the coins can quickly flow. It’s not exactly a looker but Neptune’s Quest can deliver some impressive underwater action – up to 500 times your bet on every spin/free spin. If you like the myth and legend theme, then you’ll want to dive into these waters. I would also try Novomatic’s iconic Lord of the Ocean which is more volatile.